Triglav is Slovenia’s one and only national park. It’s maybe small but if you think you can “cover it” in a couple of days, you are wrong. 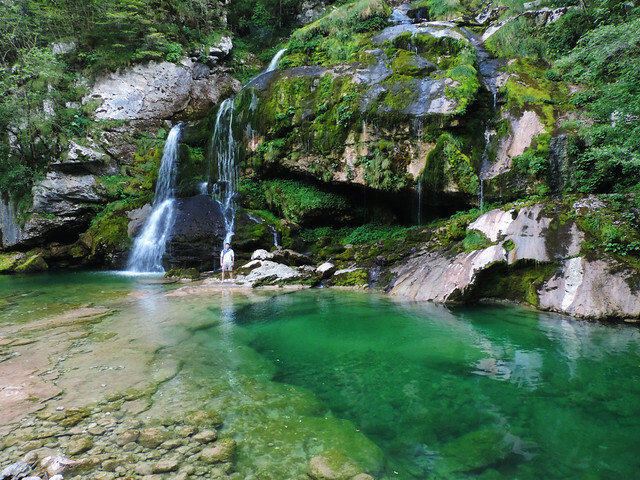 There are so many beauties hidden in Triglav National Park! We spent like a week there last summer and we still felt we just got a taste of what it has to offer: the Julian Alps, Lake Bled and Lake Bohinj, the fairy tale valley of Soča River… and a bunch of waterfalls. We love waterfalls and whenever we visit a national park we spend some time waterfall hunting for sure. So did we in Triglav. And it’s a very rewarding thing to do. Triglav has several lovely waterfalls and it looks like most of them are not even very well-known. At least once we left the busy area around Lake Bled and Lake Bohinj the number of people we met in the park dropped significantly. On the other hand, all the waterfalls we found are so easy to access! Okay, first of all you need to access the trailhead and driving there can maybe tricky – narrow, dirt roads and all that. But once you are at the trailhead all of these waterfalls can be accessed by a nice, short (10-20 minutes) walk. So what are these waterfalls we are talking about here? Savica waterfall (Slap Savica in Slovene) is the most easily accessible of all the waterfalls we encountered in Triglav. And by this we mean approaching the place itself in the first place. Because the trailhead to Savica is located near the southern shore of Lake Bohinj (along the way towards Ukanc). It’s one of the most accessible – therefore also one of the busiest – area of Triglav National Park. That means you are better to do this short hike early in the morning. 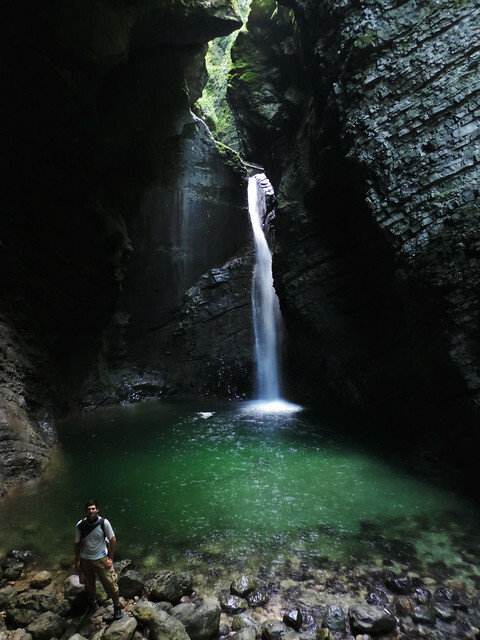 The hike itself is a nice and easy walk through a forest and it ends at 78 metres high Savica waterfall. It was the only stop on our waterfall hunt where we had to pay for parking and there’s also a small entrance fee to visit the waterfall. It’s nothing horrible we don’t even remember the exact amount, just be prepared with some cash. 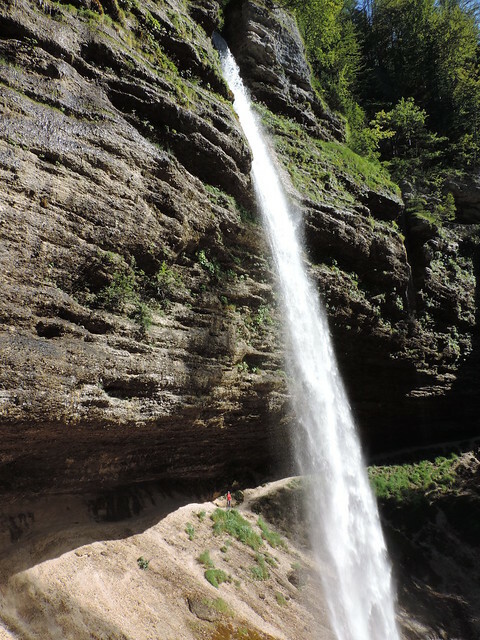 52 metres high Peričnik waterfall (Slap Peričnik) is about half an hour drive from Lake Bled. We took a turn from the main road through Triglav at Mojstrana village and a dirt road lead us to a small mountain hut (called Koča pri Peričniku). The waterfall is a very short walk from there. And the most fun thing about it? It’s one that you can walk behind! Be warned though that you’ll get wet and you’ll be amazed by the countless waterdrops gleaming in the sun. 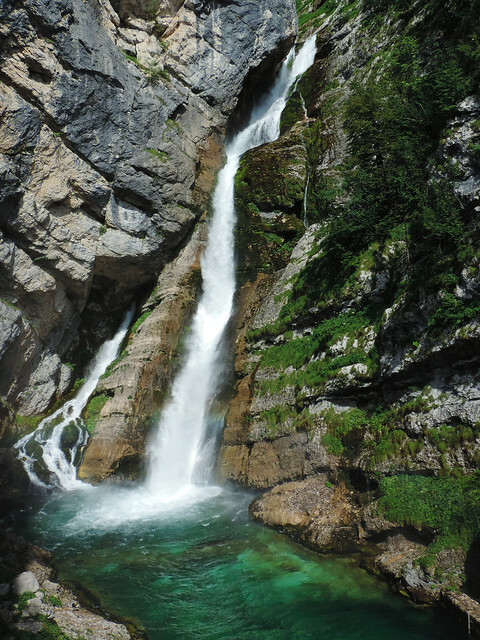 Now come the fabulous waterfalls of the Soča Valley that is a more remote area in Triglav. It takes time and effort to get to the Soča Valley but it’s really worth all that. In one hand, the drive through Triglav is very scenic – one day was barely enough for us to do it because we stopped so many times. On the other hand, Soča Valley is a magical place! And some charming waterfalls add even more magic to it. Like Boka that is actually the highest waterfall in Slovenia with 106 metres. We could already see it from the road and there’s a short walk to a viewpoint from there. It’s very impressive, the only thing we missed is that it’s not possible to get close to it. 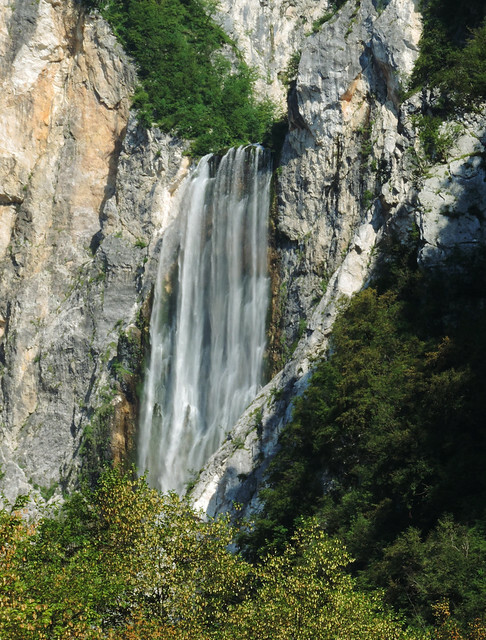 Virje waterfall (Slap Virje) is smaller and more hidden than Boka but it looks like it was stolen from a fairy tale. It’s not far from Boka (about 15 minutes by car) and a short trail leads to the waterfall from the small town of Plužna. You can get as close to it as you want – even jump into the emerald green pool in front of the waterfall. We warn you though: the water is very cold. Last but not at all least, another hidden gem: Kozjak waterfall (Slap Kozjak). Again, it’s quite easily accessible. The short trail starts in the town of Kobarid. Just head to the direction of Drežnica then you’ll soon notice a parking lot, that’s where it starts. It was a charming 20 minutes hike that ended at a narrow canyon that hides the waterfall from sight until the last moment. But then… we got it all. Lovely Kozjak waterfall with its emerald green pool and with a few light beams that can reach the bottom of the canyon – it’s a gorgeous view! Have you been to Slovenia? Any waterfalls to add to our list? Previous post Collect Moments, Not Things? What About Souvenirs? Next post [Video post] Fall For Grand Teton National Park!